When painting, you will notice that some of your drawing areas are not closed. To close the zone, you can draw the missing line with the Brush or Pencil tool. You can also close the gap with an invisible line. To do so, you can use the Close Gap tool or the automatic close gap feature. A gap is a hole or break in your lines causing a zone to be opened, therefore not paintable. You can often find gaps where lines intersect or if you erased a portion of the line accidentally. 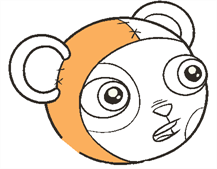 The Close Gap tool is used to close small gaps in a drawing. The Paint tool only paints closed areas. The Close Gap tool creates a small, invisible stroke between the two closest points to close the colour zone. You do not need to trace directly over the gap. You can draw it a few millimetres away and the two closest points are automatically chosen and the gap between them is closed. 1. In the Drawing Tools toolbar, select the Close Gap tool under the Paint tool category. 2. Select Tools > Drawing Tools> Close Gap. You can display invisible lines by selecting View > Show Strokes or pressing [K]. 3. 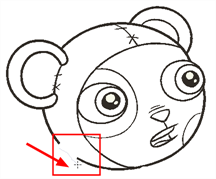 In the Camera or Drawing view, draw an invisible line near to the gap to be closed. The gap closes automatically. The new invisible line closing the gap appears. 4. In the Drawing or Camera view, paint the newly closed zone. The Auto Gap option is used while painting drawings with small gaps. 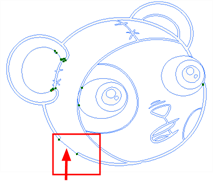 Instead of having to close them manually either with the Brush tool or Close Gap tool, Toon Boom Studio analyzes the drawing and close the gaps while you paint according to the selected mode. • No Close Gap: No opened zones, regardless of the zoom level, is painted. • Close Small Gap: Only the zones with very small gaps in the lines are painted. Larger gaps are not painted. • Close Medium Gap: Zones with small and medium gaps are painted. The zones with larger gaps are not painted. • Close Large Gap: Zones with small, medium and large gaps are painted. Although, zones with very wide gaps are not painted. The automated gap closing is done using the zoom level of your Camera or Drawing view. 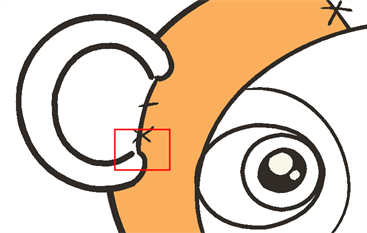 If your eye does not see the gap, Toon Boom Studio won't either. 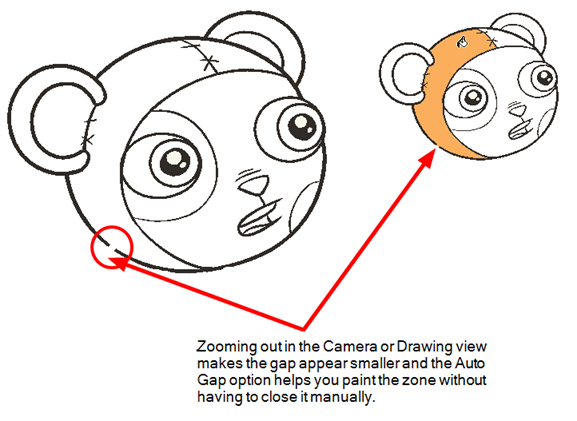 If the gap is too big in the Camera or Drawing view, Toon Boom Studio does not close it and the zone is not painted.